If you ever want the definitive answer on anything, just ask "s9." Oh jeese. I never meant to do that. I was just checking if he made the script check for things like that. Im sorry. I figured it was a "this isn’t really going to let me post without logging in or something, right??" kind of post. Hehe ya it sure was. How come Anthony lets anyone post on his blog? Isn’t it just his, and viewers can only write commenst for his news? I just think it’s more interesting that way. If it were getting overrun by other people constantly posting stuff that I didn’t care about, I’d enable the must-login-to-post feature. But I haven’t had any problems with it the way it is. you DO have a problem with your random quote being in the middle of the recent posts box, though. at least in firefox. > middle of the recent posts box, though. at least in firefox. Both my FireFox 0.8/Linux and FireFox 0.8/WinXP render it correctly. If it only affects your platform+browser (FireFox/Win2000) then I have no way to verify or debug it. I am running FireFox .8 on W2k Pro and having no rendering problems. I am seeing the random quote within the recent posts / replies box on Win2K, Firefox 0.8. Really? You’ve been using Mozilla 1.6 for months now... has it always been messed up for you? Nope, it started just a few days ago. :( It really bugs me. That makes no sense whatsoever. I haven’t changed any code on the site anytime in weeks, and your browser hasn’t changed. I haven’t changed anything. I’ve always had it set to display random photos. The font size does not affect it. I tried changing it and it still stays in the wrong spot. > about, I’d enable the must-login-to-post feature. This sounds like a challenge......I’m down. Let the games begin. 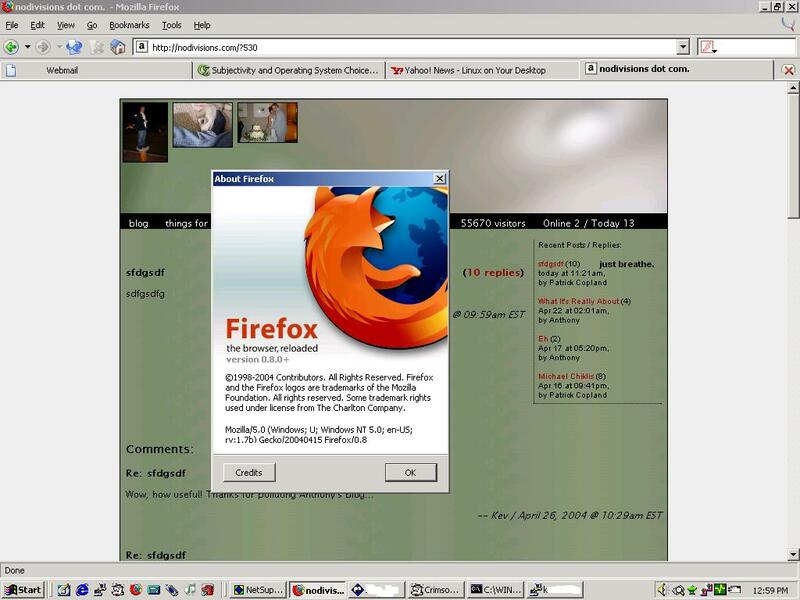 Under Firefox 0.8 and Mozilla 1.7b on Windows 2000, the problem happens. When I turn off the random pictures option, the quotes come up correctly under both of the above mentioned browsers. I guess you were right, Anthony, the bug seems to be within the random picture pref.